When X-Men: Days of Future Past hit the restart button on the continuity of the franchise, it opened the door for the filmmakers behind the series to tweak a few things that didn't go so well in the movie universe over the last 15 years. From what we've seen so far, this includes the fact that Cyclops is now alive in the future, and that Wade Wilson a.k.a. Deadpool wound up taking a very different path than his X-Men Origins: Wolverine counterpart. If new evidence can be believed, however, another big alteration that we can soon expect to see unfold is that the comic book franchise will be rebooting the character Warren Worthington III, a.k.a. Angel. 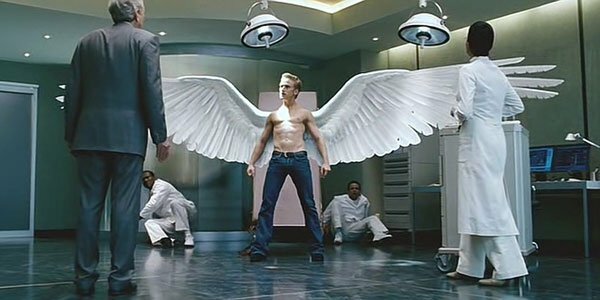 There has been speculation about Angel being a part of the X-Men: Apocalypse cast ever since blond British actor Ben Hardy joined the cast of the 2016 blockbuster last month, though fans of the franchise will be quick to point out why the inclusion of Warren Worthington III is a bit wonky. After all, he was played by a 25-year-old Ben Foster in X-Men: The Last Stand, which means he would be approximately three years old in 1983 - the setting of X-Men: Apocalypse. Unless the massive continuity change featured in the 1973-set Days of Future Past caused Warren to be born about 18 years early, an explanation is going to be required in the movie. Of course, it's actually hard to blame Bryan Singer and the other X-Men: Apocalypse filmmakers for including Angel in the upcoming film, as the character is famously and tightly linked to the movie's titular villain. In the comics, Angel at one point becomes a member of Apocalypse's persona guard, best known as the Four Horsemen. At this time, Apocalypse transforms the flying mutant, and in addition to multiple genetic alterations, his beautiful feathered wings are replaced with organic metal ones. At this point, it's pretty easy to guess that Angel will be undergoing this procedure during the 2016 feature. X-Men: Apocalypse is gearing up for production now, and in addition to the aforementioned Ben Hardy, the blockbuster will also star James McAvoy, Michael Fassbender, Jennifer Lawrence, Nicholas Hoult, Evan Peters, Rose Byrne, Tye Sheridan, Alexandra Shipp, Sophie Turner, Kodi Smit-McPhee, Lana Condor and Oscar Isaac. Look for it in theaters May 27, 2016.